Assembly organizers have secured the following lodging arrangements for the climate assembly January 28-30, 2016. Ramada Inn, 150 Douglas Avenue, Altamonte Springs, 20 non-smoking rooms with 2 beds available at $82.17 plus tax. Days Inn, 8245 U.S. 17-92, Fern Park, 10 rooms with one king bed and 26 rooms with two double beds, all non-smoking. 1 king=$76.50+tax, 2 doubles=$68.00+tax (1-2 adults), 3 in a room =$76.50, 4 per room=$85.00. Free cont. bkfst., free wifi, pool, pkg. Deadline to reserve or to cancel reservation, January 21. 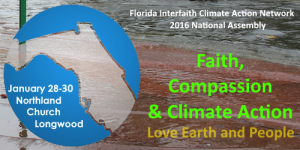 Call 1-877-361-2506, reference Confirmation # 88261770 for the Interfaith Climate Group.